Besides the undulating Berkshire Hills, pre-Civil War buildings and the Nantucket Sound, your Massachusetts vacation can include some pretty spectacular lodging. These coastal peninsulas and islands, such as Martha’s Vineyard and Nantucket, inspire some of the most beautiful inland and ocean-surrounded getaways on the East Coast. European bed and breakfast-inspired inns, 19th-century whaling captain mansions and replicas of Irish fortresses await you - here are our top Massachusetts vacation spots! While the history and panache of Boston makes for a fun time, a true vacation is about getting away from the hustle and bustle and giving yourself some time to unwind. In the Massachusetts area, the best place to do so is without a doubt the Berkshires, a range of rolling hills in western Massachusetts. The Lanesborough Country Club knows this, and wants to share it with the world (and you, in particular). Named one of the 200 Last Great Places by The Nature Conservancy, the Berkshire Hill Range is a rural destination with a cultural scene to rival far larger urban dwellings. The beautiful vistas are rivaled only by the wealth of fun activities to participate in, and the Lanesborough Country Inn is absolutely filled to the brim with such exploits. Watersports, hiking the trails, and golf are all just a stone’s throw away, while the more advanced adventure-seeker can try out Ramblewild Aerial Adventure Park just down the road. Accommodations are modest but quaint, with both cabin and motel rooms available. Most rooms have bathtubs, and the wi-fi is, of course, complimentary. So next time you’re in Boston, make sure you find time for the Berkshires. And if you’re making time for the Berkshires, you might as well make some time for the Lanesborough Country Club. The average regional elevation of the Berkshires ranges from about 700 to 1,200 feet. Sir Francis Bernard, the Royal Governor from 1760-1769, named the area "Berkshire" to honor his home county in England. Luxury, elegance, and a breathtaking waterfront setting welcome you to the New Seabury Resort. Resting in beautiful Cape Cod, Massachusetts, this stunning resort community is everything you're looking for in a charming coastal experience. Top it all off with excellent cuisine at the Popponessent Inn, which offers a relaxing dining experience. And of course, if you're looking for adventure, the surrounding Cape Cod area is home to a variety of activities and attractions. Shop at Mashpee Commons, catch a live show at the Cape Cod Center for the Arts, or tour the local Cape Cod lighthouses. There's something for everyone to enjoy at this majestic seaside getaway! Bask in the magnificent ocean views as you enjoy a round of championship golf, or stop by their private beach club that offers relaxing cabanas, a pool, and easy access to the soft-sand shores. If that's not enough, the resort features a tennis pavilion, fitness center, and a 42,000 square foot clubhouse complete with golf shop, dining room, and lounge. You'll have access to two 18-hole golf courses, their 42,000 square foot clubhouse, a private beach club with cabanas, swimming pool, Beach Bar, a fitness center, 12 Har Tru tennis courts, and two onsite restaurants. After winding along a rural route lined with pines and hardwoods shooting up from the grounds of Western Massachusetts' Berkshire region, you’ll come to a mansion. 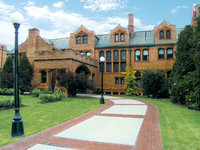 It is Cranwell Resort and Spa – home to one of the largest spas in the Northeast and a member of Historic Hotels of America. You’re thinking, “an old mansion in the hills. That’s nothing new.” And you’re right. But that’s the very essence of what makes Cranwell a must-stay destination tailored for couples and families who have a deep appreciation for everything beautiful – naturally, historically, architecturally, etc. Surrounded by the landscape’s natural contours – partly preserved as the resort’s championship golf course for more than 80 years – the Tudor-style mansion is a stately sight to be seen. Constructed in the opulent Gilded Age, Cranwell was a hilltop haven for wealthy industrialists, clergy and golfers at the turn of the century and today continues to be an accessible hideaway for you. Cranwell’s 114 distinctive guest rooms, suites, cottages and townhouses boast take-your-breath-away panoramic views of the surrounding peaks. And 58 of those rooms are connected by glass walkway to the 35,000-sq.-ft. spa featuring more than 50 services and a 60-ft. indoor pool. Cranwell’s renowned 18-hole golf course was built by Wayne Stiles and John Van Kleek in 1926 on the site of the original Berkshire Hunt Club. From New York City, take the Henry Hudson Parkway North to the Saw Mill River Parkway. Follow the Saw Mill River Parkway North to the Taconic State Parkway, at Hawthorne, NY. Follow the Taconic State Parkway North to its intersection with Route 90 (NY Thruway) and take Route 90 East to Mass Turnpike (Route 90). Take the Mass Turnpike East to Exit 2 (Lee, MA). Turn right off of the exit ramp onto Route 20 West. Follow Route 20 for 3.5 miles. Cranwell is on Route 20 on the right (look for the mansion on the hill). Fitness center, tennis, cross-country skiing, Wyndhurst and the Music Room restaurants, Sloane’s Tavern, Spa Café and banquet rooms. An exciting family vacation, friends retreat or romantic getaway is waiting for you in Martha's Vineyard. This beautiful island features spectacular views of the Atlantic Ocean and plenty of recreational activities for everyone! Find the perfect home-away-from-home with Sandpiper Rentals and enjoy an unforgettable island experience. Only accessible by boat or plane, Martha's Vineyard offers a calm retreat. Indulge in stretches of sandy beaches, lush flora and fauna, and towering trees! The island welcomes nature-lovers and outdoor enthusiasts alike. Join a local fishing charter or rent a boat for a day on the waves. Bask in the magnificent vistas as you explore ancient walking trails. Everything you could ask for a comfortable and fun vacation is right here! Next time you're planning a beach getaway, you don't have to worry about leaving your furry friends behind. Sandpiper Rentals offer lavish pet-friendly accommodations! This way Fido can enjoy the adventure. Explore the wonders of Martha's Vineyard with your four-legged friend by your side. Head to Boston's North Shore for an unforgettable Massachusetts getaway. Atlantic Vacation Homes offers an impressive selection of properties sure to fit all of your travel needs! The convenient location of the Atlantic Vacation Homes directory, just a half-hour's drive north of downtown Boston, makes for an incredible east coast beach vacation. Whether you are looking for something on the waterfront, with a water view, or a home specifically designed for larger groups, they have you covered. They also have many pet-friendly units for those travelers who can't leave home without Fido. Local charter companies offer plenty of opportunities to explore on the water. Fishing and lobster charter create some exciting action, while whale watching and scenic tours are perfect for travelers of all ages. There are plenty of local beaches to explore if you're looking for a fun-filled day in the sand and sun, and make reservations at Ohana for at least one meal during your stay (highly recommended)! Kayak and Stand-Up Paddleboard rentals are available for those travelers looking to spend sometime on the water. Contact Atlantic Vacation homes directly for more information and pricing details. Want to get the most out of your trip to Atlantic Vacation Homes? Make sure to download their mobile Guest App before you arrive. It will help you unlock the secrets of the area and have a great vacation. Hopper Real Estate's assortment of adorable abodes are a superb way to experience all that Massachusetts has to offer! And boy does it have a lot! From the famous ocean beaches to the sunset kissed Cape Cod Bay, Eastham is everything an aquaphile could ever want. There's also plenty of bike paths, nature trails, and historic sites nearby to keep your attention for months on end- it's too bad you're (probably) only staying the weekend! As for the properties themselves, many are right on the beach, affording inhabitants supremely easy access. You'll truly know it's a vacation when you can step out the door and feel cool sand between your toes! The population of Eastham was 4,956 at the 2010 census. Hopper has the largest inventory of vacation homes in Eastham. Enjoy a taste of Edgartown history at Harbor View Hotel. Whether it's sailing out from the on-site marina or savoring a meal at Water Street Restaurant on Martha's Vineyard, the historic Harbor View Hotel offers you just the right touch of luxury in Edgartown, Massachusetts. Spend a day lounging on the beach. Walk among historic homes or visit the stunning lighthouse. The wide variety of activities nearby makes it an ideal destination. And, at the end of the day, return to the historic hotel. Wrap yourself in a plush robe and lounge in your comfortable room among sophisticated and charming decor. All this and more is waiting for you at Harbor View Hotel! Harbor View's on site restaurant was rated "Best Breakfast on Martha's Vineyard" by Cape Cod Life Magazine in 2008. The historic Harbor View Hotel was originally built in 1891. Have you ever wanted to live the lifestyle of the insanely wealthy – if only just for a day? At Blantyre, you can. In fact, they won’t kick you out if you want to stay longer. But we will warn you, life outside this impeccably preserved Tudor-style mansion will seem duller after you’ve been here. An architecturally beautiful masterpiece built in the 1890s, the Blantyre radiates big bucks and a bygone way of life. Rolling, manicured lawns cut out from the vast Berkshire Hills is the setting of this aristocratic property that was originally modeled after a house in Blantyre, Scotland. Inside the vine-covered walls is just as breathtaking. We’ll put it this way; you are definitely going to want to take your shoes off at the door. Incredible, intricate woodwork, an eclectic blend of period pieces and complementary art grace the interiors of the Main House, Carriage House and cottages. There are even bed curtains to relax behind! You probably won’t want to leave your bedroom, but you won’t be disappointed if you do. Take part in lawn sports or a cooking class, or set up a wine tasting with selections from Blantyre's extensive cellars housing more than 19,000 bottles from around the world. From New York City, take the West Side Highway North to I-87 (NYS Thruway) to Exit 21A (Berkshire Spur) and take I-90 East to Exit 2, Lee, MA. After the exit, turn right onto Rt. 20 West. Go 3.1 miles through the village of Lee and watch for a Commonwealth of Massachusetts directional sign on the right side of the road. Take a right onto Blantyre Road and you will see Blantyre up ahead. Blantyre made the Conde Nast Traveler Gold List in 2008. Make your stay at Blantyre even better (if that’s possible) with a body treatment or massages at The Potting Shed Spa. Help your mind, body and soul become one with the satisfying solitude and rejuvenating elements that only Canyon Ranch in Lenox can give you. The instantly-calming Berkshires location and the fitness, nutritional and spiritual programs at the 126-room resort are just the beginning. Canyon Ranch is really unlike anyplace you’ve been. Well, it was for us, at least. As soon as you see your room or suite, you’ll know that this resort is aiming to please in every possible aspect. A choice of non-down or down pillows, plush terrycloth robes and signature bath products will help start your physical and spiritual transformation. Meet with world-renowned health specialists on site and create an integrated health and well-being plan that’s tailored to you. Next, you can take part in one of many planned or on-the-fly invigorating experiences, like an ancient East Indian meditation hour, a therapeutic massage in the 100,000-square-foot spa or an unhurried, early morning walk through the resort’s undulating grounds. Even the food at Canyon Ranch has been chosen and prepared with your nutritional wellness in mind. No, that doesn’t mean bland, dry bagels and water. It means the freshest protein, vegetables, fruits and herbs concocted into pure deliciousness. Yum! For your utmost relaxation, Canyon Ranch guests must be at least 14 years old and cell phones are only permitted in designated areas. Canyon Ranch’s renovated Bellefontaine Mansion – housing the dining facilities – was built in 1897 as a replica of Louis XV's Versailles chateau. Guided hiking and bike tours, cooking classes, canoeing and more than 40 daily fitness classes. With stunning gardens, an award-winning restaurant, and much more, Stonehedge Inn and Spa offers you a unique Massachusetts experience. While it is just a short distance from Boston, Stonehedge Inn and Spa in Tyngsboro, Massachusetts, offers you an escape from the hustle and bustle of the city. 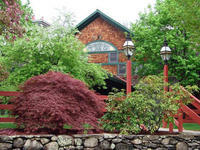 Standing on 36 acres of New England woodlands, Stonehedge Inn offers you privacy and comfort. Privacy is just the beginning, though. The inn offers AAA Four Diamond accommodations that bring the perfect touch of luxury to your vacation. From plush beds to heated towel warmers, your room is filled with luxury, and whether you spend your day at the spa or sample the fare at the on-site restaurant you are sure to find a wonderful way to spend the day. Stonehedge Inn and Spa has been awarded the Wine Spectator’s Grand Award since 1996. Find your New England adventure at Jiminy Peak Mountain Resort! Jiminy Peak Mountain Resort is the largest ski and snowboard resort in southern New England, but this resort offers more than just slopes. Whether you're visiting Mountain Adventure Park in the summer or hiking through the beautiful surroundings, the resort offers exciting activities for all! After a day of excitement, you can retire to one of the comfortable Country Inn rooms or vacation homes for an evening of rest and relaxation. Lounge in your room or relax in a whirlpool tub. All this and more awaits you at Jiminy Peak Mountain Resort! Ocean Edge Resort & Golf Club offers incredible luxury and service to anyone who feels like treating themselves. Split into two “sides” (mansion and village), guests love the freedom of being able to do exactly what you love - golf, tennis, swimming, dining, biking or simply relaxing. Be it romantic escapes, group celebrations, or memorable family gathering, Ocean Edge can cater to you, with each side bringing its own experience and air of casual elegance. If you’re looking for a relaxing weekend getaway, pamper yourself on the AAA Four Diamond Rated Mansion side of the resort. There are a veritable cornucopia of activities for you to immerse yourself in: a private beach, outdoor and indoor pools, a tennis complex staffed by professionals, a cardio/weight room and fitness studio, and even a spa treatment room. After, go and get some exquisitely prepared grub at one of the two onsite restaurants. If you’re interested in playing as much golf as possible, perhaps the village side of the resort would be more fitting. Spanning 380 acres, there is more than enough space to enjoy all of your favorite recreational activities. Hit the links on the private Jack Nicklaus designed golf course, driving range, or putting green. Grab a racquet and a partner and test out one of the 11 tennis courts, or go on a leisurely bike ride on the historic, scenic 26-mile Cape Cod Bike and Rail Trail that alongside Cape Cod. There are tons of options; it’s up to you to choose! Brewster, Massachusetts, averages 47 inches of rain per year. Ocean Edge guests are able to take a guided tour of the nearby oyster farms, and learn about the work the town of Brewster is doing to help the local economy and aquaculture. Brook Farm Inn is as quaint a B&B as any in New England, and its hospitality, guest rooms, and breakfast are second to none! This Berkshires bed and breakfast puts you right at the center of the fun! It's just a short walk to the village center of Lenox, but to experience it, you'll first have to pry yourself away from Brook Farm Inn's many charms, which is no easy task. A stay here is whatever you make it. Indulge in a rejuvenating retreat, an adventurous outdoor lovers getaway, a tranquil escape, and eat plenty of scrumptious breakfasts throughout your stay! All 15 guest rooms feature ensuite baths, beautiful views, tasteful décor, and most include a fireplace for cozy winter nights. What more could you want? The inn features 15 premium guest rooms, all with ensuite baths, air conditioning, hair dryers, unlimited domestic long-distance calls, and toiletries from Italy. Start your day with a sumptuous breakfast buffet, served at 8:30 a.m.!